To say that there’s an independent spirit in Vermont is a dramatic understatement. This is the state where Bernie Sanders built his progressive outsider identity. And before it became a state in 1791, Vermont operated as an independent republic for 14 years. And that’s why Vermont is the perfect setting for environmentalist Bill McKibben’s new novel about organized civil dissent, Radio Free Vermont: A Fable of Resistance. 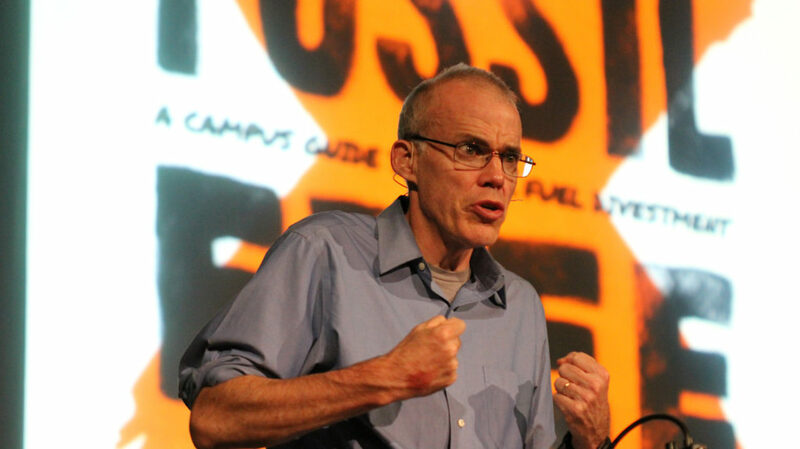 The novel — McKibben’s first — is about a ragtag crew of activists in Vermont, led by a septuagenarian pirate radio/podcast host, who engage in civil disobedience to promote an independent Vermont. It’s a timely book and a creative look at the value of dissent in a representative democracy. But the slim volume is a little outside of McKibben’s oeuvre. For decades, McKibben, the Schumann Distinguished Scholar at Middlebury College, has been a tireless environmental activist. His 1989 book, The End of Nature, was a clarion call for people to wake up to the seriousness of global warming. But for his most recent book, he needed a break from serious. He needed to write a book that would remind him of Vermont when he was traveling the globe espousing the dangers of climate inaction. Radio Free Vermont is that book. If you love the Green Mountain State (or Bernie Sanders) as much as McKibben, then this book is for you. Larry Wilmore: Black On The Air — You might know Larry Wilmore from his turn as the “Senior Black Correspondent” on The Daily Show a few years ago. Or from his own late-night turn, The Nightly Show with Larry Wilmore. But none of that even scratches the surface of Larry Wilmore’s body of work. Remarkably, he’s had a hand in the some of the most popular TV shows of the past few decades — In Living Color, The Fresh Prince of Bel-Air, The Bernie Mac Show, Insecure, Blackish, we could go on. Wilmore is obviously a busy guy, but somehow he still has time to make a podcast. Outside/In’s “Powerline” series — Like many states, New Hampshire has been grappling with how to provide power to its citizens cheaply and responsibly. And one way to do that is to buy hydropower from the Canadian province of Quebec. But as our pals from New Hampshire Public Radio found out, it’s not that simple. Reporters Sam Evans-Brown and Hannah McCarthy dig into not just the history and environmental concerns of hydropower, but also the emotional and cultural impact of the utility on thousands of indigenous people whose land has been destroyed by the dams. Slow Burn — If you’ve been following American politics lately you’ve no doubt heard comparisons between Donald Trump and Richard Nixon. They’re hard to avoid, especially as the Trump administration is under investigation for colluding with Russia. At the heart of both Watergate and the Russia investigation is election tampering. That’s what makes this show so timely. Host Leon Neyfakh looks back on the Watergate scandal through the eyes of the people who lived it, like former Congressional staffer Curtis Prins and veteran journalist Lesley Stahl.